Tree Cabling Services with Lusk Tree Services Inc.
Our arborists can identify trees with weakly attached co-dominant stems as shown below. The failure of the maple above could have been prevented with the installation of a cabling system. 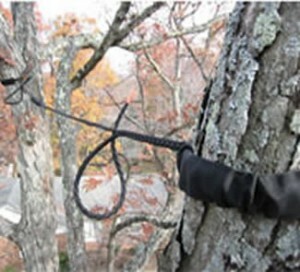 Close up of Cobra cable attachment to prevent a maple tree from splitting apart. 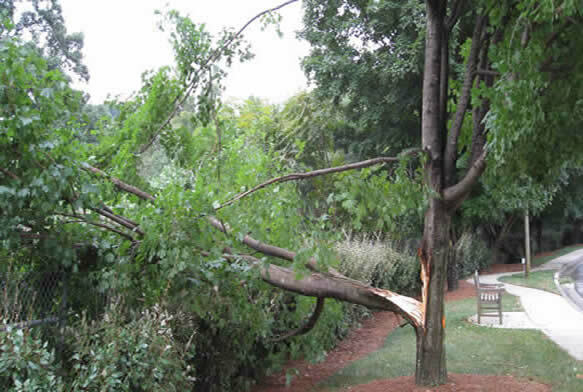 Cabling can save trees from severe damage due to storms, ice, and wind. Cobra Cable Systems, widely used in Europe, these cables, unlike steel cables and steel bolts, are non-invasive. They require no drilling. They are dynamic systems that allow normal tree movement while maximizing support of weak crotches and weak limbs. These systems are also adjustable. Below is a diagram of a Cobra cable, The cables are highly effective for small and large trees and require no drilling or metal hardware installation. For more information on tree cabling, please contact us by phone at 336-924-5911. “Your crew that worked last week at my home did an EXCELLENT job! These guys are real pros, it was a pleasure watching them work. Thanks again for doing such a great job. We appreciate the very professional attitude of your entire staff.